Need an REAL engine stand? One that will last forever? One that will be the most stable and safe you have ever used? The one that is preferred by master mechanics and project engineers at all the "big three" engine plants for 35 years? Look no further! 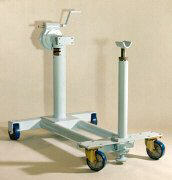 Devin stands are being used at Chrysler, Ford, GM and Saturn engine factories all over the globe. Superior construction, four point base, large wheels and casters, a patented silky smooth, self-locking gearbox. These are some of the reasons to choose a Devin engine stand. So rugged and so sure are we of our "no compromise" quality, that our stands are guaranteed for life. Even those that are in daily use at the engine factories are protected by our guarantee. Not cheap. Just the BEST and the SAFEST engine stand you will ever buy! Tell us what you need - we'll build one for you. Please fill out completely and be sure to include your specifications. © Copyright 2018 Devin Mfg., Inc.. All Rights Reserved.